Contact lenses are a great way for both children and adults to see the world more clearly without the hassle that comes with wearing eyeglasses. While many parents might think their child is ready for contact lenses, it is important to recognize a few key things before making the ultimate decision on whether a child is mature enough for delicate contacts. After you have asked yourself these questions, you can then begin discussing contact lenses with your child. While they may be wanting the lenses to participate in athletics, to improve their appearance or to make their life easier without the hassle of glasses, they must know everything about taking care of their contacts. Talk to your child about the amazing benefits that come with contacts, but also be sure to tell them about all of the responsibilities that come with wearing contact lenses. By doing this, you can get an idea of whether your child is actually ready for contact lenses. If you are asking yourself whether your child is old enough, you may be thinking the wrong way. 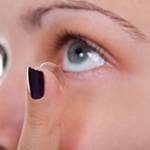 Contact lenses are designed for children as young as 8 years old and can be made to work with children of all ages. The most important question to ask yourself and your child concerns maturity, rather than age. When parents and children are discussing contact lenses, it is very important that both the parent and child are on the same page. When parent-child units have a combined and clear idea of what they are looking for in contact lenses, they will be more successful at wearing contacts. Communication is key when you’re deciding whether contacts are a right fit for your child.